There's nothing better than taking a sip of hot coffee from your favorite mug in the morning. Preparing coffee is the first thing I do when I wake up and before even going to the bathroom to brush my teeth. I used to prepare coffee in the electric coffee maker, and that worked for me for some time, but after a while, it wasn't the same as in the beginning. Using electric coffee maker is one of the fastest and easiest ways to prepare your coffee because it's simply pouring boiled water over the coffee. However, because of the constant boiling and metal interiors, water tends to leave big scale marks on the bottom of the coffee maker that are hard to take off. Not to mention the taste deteriorating. Because of that, I used to buy new electric coffee makers when my old one wasn't good anymore, but I realized after a while that that is not the solution. So, I went searching for the coffee maker that will fill my needs and help me prepare my coffee in the morning without worrying that my coffee will taste like scale. I didn't search for too long when I discovered the French press coffee maker. What Is A French Press Coffee Maker? How Does French Press Coffee Maker Work? What To Look For In Your French Press Coffee Maker? French press coffee maker, or as I like to call it my little coffee maker, is basically a cylinder-shaped container, usually glass but often it can be made of plastic or steel, that lets you brew coffee on your own. It's very popular in the world, especially in France. First, you heat the water on ﻿﻿the stove, and then you put coffee into the container. Like almost everything else you make, it's important that you use the right proportions of coffee and water while you are brewing your coffee. I usually use 20 grams of coffee or 4 teaspoons. If you use less your coffee will be all watery and thin, unless you like it that way, so it's basically up to you. Note: It's essential that you use medium grind ﻿﻿coffee, but you can use a filter coffee too. Check the water to see if it's done then pour it into the container. The water should be hot, not boiling. When it's done, pour it into the container until it's half full then stir it with a spoon. Then place the lid on the container without pressing the plunger just yet and let it brew for about 3 minutes. After the 3 minutes has passed gently squeeze down the plunger until all the coffee grounds stay on the bottom of the container. Pour the coffee into your favorite mug and enjoy! It can't be easier than that! Note: Once you've opened up the coffee can you may consider ​putting it in the refrigerator to preserve the flavor. Although it may look easy and you may think that there's nothing you'll have to worry about when purchasing the French press coffee maker, there are a few things to consider when you are about to choose your lifetime partner in preparing coffee. Usually, most of the French press coffee makers are made of glass, but they can also be found made of stainless steel or plastic. Because of that, it's imperative if you know your material well because it's not only the aesthetics that matter, there is a lot more that you need to think about. Glass coffee maker is the most common, but that doesn't mean that it's the most effective. It is not able to contain heat as well as the stainless steel coffee maker. For example, if you are one of those people that like to enjoy their coffee for an extended period but hate when it gets cold quickly, you'll prefer stainless steel coffee maker. Glass coffee makers are good for small amounts of coffee. For example, a morning cup of coffee just for you, that is poured right away without staying in the container for too long. Also, because they are often put back to the heat, they tend to break after a while. Whether you are making just a cup of coffee for yourself or a whole container for you and your friends or family members there are standard sizes that you should consider while choosing your French press coffee maker. The most common are 12oz and 34oz French coffee makers. There is also 32oz coffee maker that is not that much more expensive than the 12oz but in my opinion is the best because it gives just the right amount of coffee. 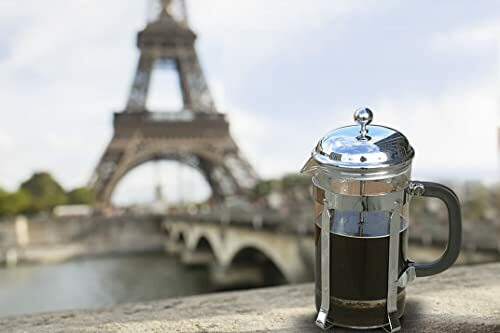 A 12oz French press coffee maker is the standard small size coffee maker and it's the main benefit is that it's portable and good for those who take their coffee to go. I've used these features as a reference to the quality product and compared the five currently popular coffee makers. Sit back, grab a cup of coffee and take a look at my French press coffee makers reviews. Remember what I said earlier about glass coffee makers? Well, this one is different because it is a double German borosilicate heat-resistant glass that is designed not to break easily. 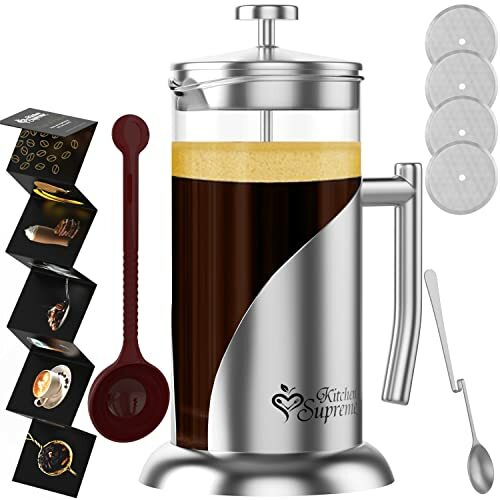 Kitchen Supreme French Coffee Bundle is a 34 oz coffee maker that has 100% stainless steel lid and plunger, alongside with a durable and heat-resistant carafe. It has four amazing filter screens for all types of coffee grounds, and it can easily serve four mugs of coffee (or 8 small cups of coffee) in one take. Other than preparing coffee, it can also be used to make tea, hot chocolate, almond milk, lemonade, ice tea and much more. The most important thing is that it gives coffee a creamy foam and pure taste which is exactly what you need to enjoy your morning ritual. It's easy to use and even easier to clean after you're done with it. I have purchased it, and I can proudly say that for the quality it gives it's really affordable. Other than coffee, it can also prepare tea, hot chocolate, and lemonade. SterlingPro French Coffee Press is also a 34oz glass coffee maker that is made of durable and heat-resistant borosilicate glass. It has a unique dual screen system that prevents leaving any additional grounds in your coffee. Also, it comes with an instruction and two replacement screens. It's very effective and it works pretty simple, and that is by adding the second screen to the first one it presses the glass wall more tightly which squeezes all the grounds, and leaves you with one liter of freshly squeezed and delicious coffee. It's perfect as a wedding present for someone who is just starting a new life in a new apartment. It can provide 8 cups of hot and ground free coffee, but it can also be used to prepare tea for all of you tea lovers. The only flaw is that it's not dishwasher safe, but on the other hand, it's easy to clean with just soap and water. And best of all, it's affordable for any household, and if you treat it carefully, it can last for a long period. 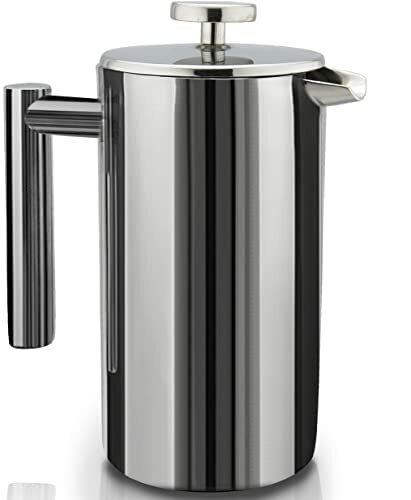 Secura Stainless French Press coffee maker is wholly made from high-quality stainless steel that forms a double wall construction, ending in a product more heat-resistant than single wall products. Because it's made from high-quality stainless steel, it can keep your coffee hot and fresh for a long time. It has three-layered stainless steel filter structure that helps you trap all coffee grounds and provides you fresh and ground free coffee. The filter screen is easy to take off and to clean. The capacity of Secura French press coffee maker is 34oz which means that it can produce 8 cups of hot and freshly squeezed coffee. It's really easy to clean and best of all, every part of this coffee maker is dishwasher safe. It has a cool touch handle which provides you a comfortable grip while pouring coffee into your favorite mug. Other than preparing hot and fresh coffee it can also be used to prepare tea. Oh la la, French really know their coffee. This is another glass French press coffee maker that is made from borosilicate glass. Every metal piece used in the construction comes from high-quality stainless steel that gives the coffee maker shiny look and protects it from rust. It has a 4-level filtration system that uses double stainless steel screen filters to provide the purest possible flavor. The filtration system is made from two stainless steel screens, a spring-loaded base that seals the edges on top, and a lid strainer which traps all grounds and gives you a pure and fresh coffee. The top cover is made from BPA-free plastic. Café Du Chateau can easily serve 8 cups of fresh and pure coffee. Other than preparing coffee it can also be used to make tea and hot chocolate. For the quality is has, it is affordable for every household. 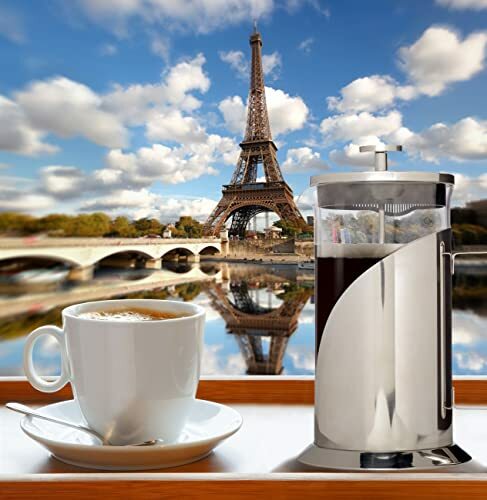 If something happens with your Café Du Chateau French press coffee maker, they will provide you with a new one and free of charge. I know this because I accidentally broke mine and ordered another and they sent me a replacement for free. 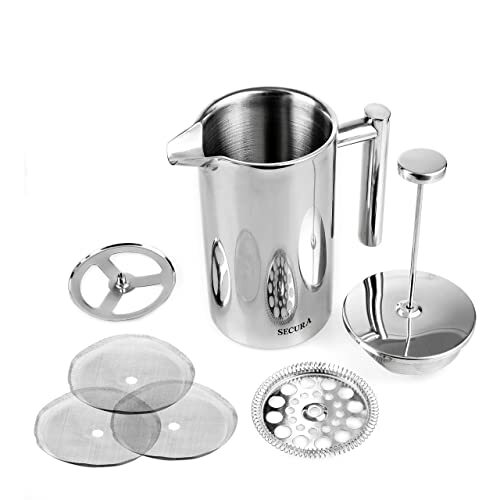 This is the first SterlingPro stainless steel French Coffee Press that has a double wall system that effectively removes all grounds and gives you freshly squeezed coffee. The double wall system other than giving you a grounds free coffee also keeps the coffee warm longer and on the other hand keeps the outside cool to the touch. SterlingPro is dishwasher safe and really easy to clean – all parts remain completely stain free after washing. 1-liter carafe can easily provide 8 cups of hot coffee that will stay hot for a long time. Other than preparing coffee it's also good for tea. It's heat-resistant, and it has a cool handle with a comfortable grip for better handling. Sure, the price is a bit higher but because of the qualities that this coffee maker has, a few extra bucks really pays off because you got yourself one great French press coffee maker. Choosing the right tool to prepare hot and fresh coffee in the morning is not an easy job. After a lot of testing and comparison, my choice is SterlingPro﻿ 1 Liter French Coffee Press because it has all that takes to make hot and fresh coffee that is ground free. I hope that my article was helpful and that you too will find your favorite French press coffee maker like I found mine. Be free to leave a comment in the comment section below if you have any questions and pour yourself a cup of coffee and enjoy!